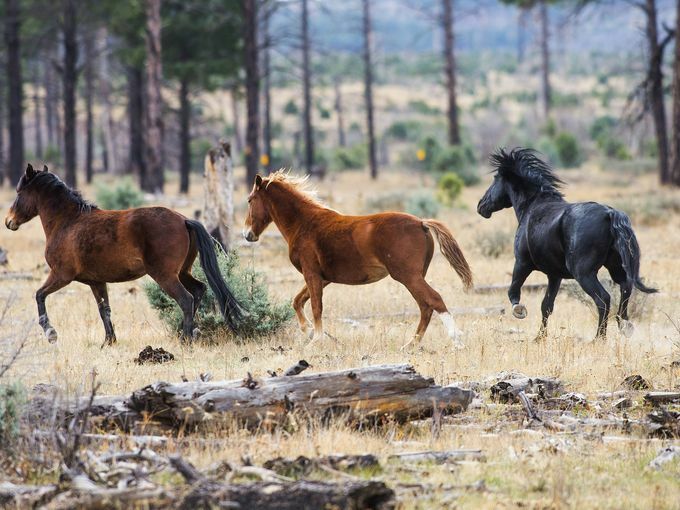 HEBER-OVERGAARD, AZ — In an update Monday, authorities said four more wild horses have been found dead in the Apache-Sitgreaves National Forest. The bodies were found February 7 inside the Heber Wild Horse Territory near 300 Road, according to a release from the national forest. The deaths bring the total number of deceased horses found since October to 16. Of those, 10 have been found to have evidence of gunshot wounds. Five had severely decomposed and their causes of death remained undetermined, while one died of blunt-force trauma typically associated with a motor vehicle collision, according to a news release. The forest service is working with the Navajo and Coconino county sheriff’s offices on the investigation into the horses’ deaths. Anyone with information is asked to call the Navajo County Sheriff’s Office tipline, 1-800-78CRIME. Poor journalism but it looks like these are newly killed animals, and also shot (reading between the lines). Is it time to put some cameras out yet? God help please protect our horses amen. These shooters are bold to have murdered even more horses after the public, the local authorities and the FBI have been made aware… maybe the local newspapers need to make these crimes headline news. It’s like they are deliberately saying ‘F-U’ to everyone, like they are assured to get away with it. VERY dangerous people! •	A Tanzanian game reserve has successfully tested the TrailGuard cryptic camera and 24/7 electronic surveillance system to detect and capture wildlife poachers and their snares. The system uses image recognition algorithms and real-time image transmission to help the often limited patrolling staff of many protected areas identify and respond to potential poachers along trails before they kill their target animals. •	Despite some difficulties with installation and the algorithms, the TrailGuard units in Tanzania have photographed 40 reserve intruders, including poachers or trespassers, resulting in the arrests of 13 suspects. The designers are currently developing a new, lower-cost version of the system to be built later this year that they expect will address the difficulties and be more widely available. It’s really important to catch the person(s) doing the killing, before humans become the targets. Proven fact is that many serial killers start out with animals. HOLBROOK — David Clouse is a grandson of former Navajo County Sheriff Glenn Flake. Thirty-two years ago, Flake pinned a badge on Sheriff Kelly “KC” Clark, who retired on Tuesday. Clouse was appointed Sheriff of Navajo County when Clark pinned the badge on him. The Forest Service has endured heavy criticism by wild horse advocates and some members of the public. An expedited investigation, forest patrols and more open communication about the status of the ongoing investigations were demanded in response to the deaths. “When it is determined that a horse’s death was due to a gunshot wound, the investigation can be complex, as the burden of proof must be rock solid for potential use in court,” states the release. Prior to this press release, the Forest Service has not shared details about their findings, but has repeatedly assured the public that open investigations were in process. 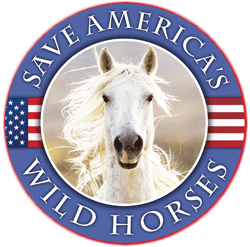 The information provided in the recent statement aligns with some information put out by the Heber Wild Horses and Citizens Against Equine Slaughter (CAES) group including the number of horses found with gunshot wounds. The total number of deceased horses reported by the boots-on-the-ground members of Heber Wild Horses was 12. Although all 12 were thought to have been shot dead, two of the horses had decomposed to skeletons, making it more difficult to identify gunshot wounds. The Forest Service’s confirmation via the press release that 10 of the deceased horses showed evidence of gunshot wounds is consistent with what the group has been reporting. ASNF also informs the public that they will be “employing additional resources to help with these investigations” including working with the Navajo and Coconino County sheriff’s offices and “deploying an additional team to conduct necropsies…” which is something the reporting parties have been requesting for months.